The department of English, one of the prestigious departments in the college, started functioning as a subsidiary department with the inception of the college in 1977. 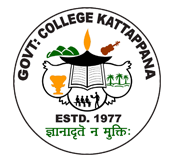 Ever since, it has been an integral part in the growth of the college, providing quality education to the students. The sanctioned strength of teaching faculty is three and all the three posts have been filled now. Over the years the department has played a pivotal role in moulding the students, improving their communication skills and equipping them to meet the challenges of a competitive world. The dedicated team of faculty leads from the front in undertaking and organizing various innovative programmes for the benefit of the students hailing from the remote areas of the district.